One of the main areas of OECD's work in the responsible sourcing of minerals is to ensure that international standards do not further marginalise workers of the informal sector. This implies working on the formalisation of Artisanal and Small-Scale Mining (ASM). ASM is a major source of mineral resources production in the world. It is largely informal, and is associated with low levels of safety measures, health care or environmental protection. 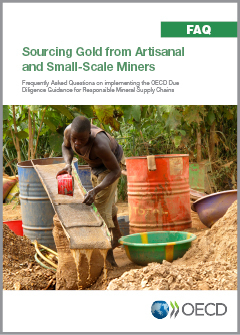 In this context, the OECD Due Diligence Guidance for responsible mineral supplly chains includes an appendix calling on stakeholders to engage in the legalisation and formalisation of artisanal mining communities. The OECD also seeks to cooperate with initiatives such as the Global Mercury Partnership to work on the reduction of mercury use for gold production.